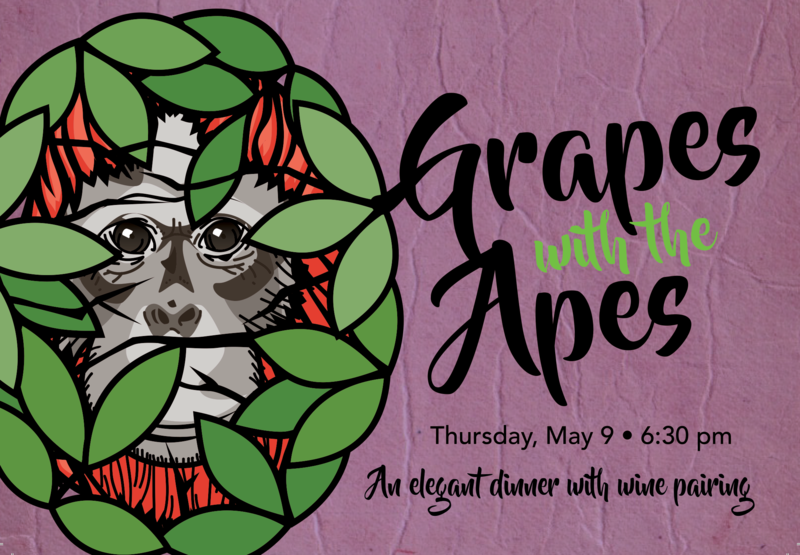 Join us for Grapes with the Apes! Featuring our Guest Speaker Graham L. Banes, PhD. who recently helped organize a National Orangutan Workshop in China where Cameron Park Zoo Interim Director, Johnny Binder, and Curator of Programs and Exhibits, Terri Cox were presenters. The workshop was a culmination of six years of planning and preparation by Dr. Banes, the Chinese Association of Zoological Gardens and the management of Nanjing Hongshan Forest Zoo. This was the first major national workshop for any non-endemic species in China and presents a major milestone in facilitating best practices for orangutan care and husbandry in China. Dr. Bane’s research has been featured on television by the BBC, ITV, and Channel 4 in the UK, and PBS in the USA. Dinner will be served in the Cameron Park Zoo Pavilion. Appetizers, Dinner, and Desserts prepared for you by Chef Nathaniel Gay- Hilton Waco. Dinner will be paired with fine wines from Valley Mills Vineyard and Wedding Oak Winery- San Saba. Dessert, dessert wines, and coffee will be served at the Asian Forest where guests will enjoy a behind the scenes tour of the building, and an opportunity to see the Zoo’s baby orangutan, Razak. Tickets are $150 per person or Sponsor a table of 8 for $1,200 and each of your guests will receive a special gift. Proceeds benefit the Cameron Park Zoological & Botanical Society Conservation Fund. Grapes with the Apes is for Adults 21+ only. Grapes with the Apes will take place rain or shine. In the event that you are unable to attend, please consider your ticket purchase a donation to Cameron Park Zoo.